Beautifully engraved certificate from the Getchell Mine, Inc. issued in the 1940's and 1950's. This historic document has an ornate border around it with a vignette of an eagle. This item is hand signed by the Company’s President ( George Wingfield ) and Secretary and is over 48 years old. Discovered in 1933 and quickly purchased by Noble Getchell. Quickly became a huge operation with a 400-ton mill and a company town with almost a hundred homes. The mine produced copper, silver, arsenic, tungsten and gold. Operations continued until 1967. The mill was taken down and only foundations remain. 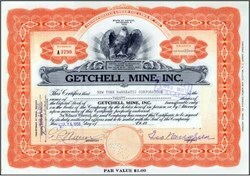 The Getchell Mine has produced more than $60 million and counting making it one of the richest districts in Nevada. When George Wingfield came to Northern Nevada in the late 1800's no one knew what impact he would eventually have on this western state. Born in Arkansas in 1876, by 1906 Wingfield had become a prominent (and rich) businessman not only in Nevada but also throughout the U.S. As owner of the Goldfield Consolidated Mines Company, George became a multi-millionaire by age 30 and for a time owned every bank in the state. One of George's favorite pastimes was to bring his favorite hunting dogs and his best friends (such as Herbert Hoover, Bernard Baruch and others) to his "Nevada Oasis", the Spanish Springs Valley Ranch that is now Wingfield Springs. For almost a quarter of a century he devoted his efforts to improving his ranch, extending ponds, building a first class facility for his prize-winning quarterhorses and Labrador retrievers and enjoying the area's natural beauty from the original ranch house in the old cottonwood grove that remains today. George Wingfield has been a major figure in Nevada history at least since 1912, when he turned down an appointment to the United States Senate. A political and economic titan, he made a tremendous fortune in the gold fields of central Nevada in the early twentieth century, and went on to own a chain of banks, numerous ranches, and several Reno hotels. Active in political party circles in the 1920's, he became the reputed boss of both Democratic and Republican parties. George Wingfield's power was legendary in his own time, and was publicly demonstrated when the collapse of his twelve banks in 1932 almost led to the economic ruin of the state. During his lifetime, there were at least two offers to make a Hollywood movie based on his experiences. For a period of years early in the 20th century, Wingfield could be described without exaggeration as the "Owner and Operator of Nevada." His legacy to the state has been controversial. Some have revered him as Nevada's benevolent "friend in need." Others have condemned him as a "sagebrush caesar," a man who dominated the state politically "as arbitrarily as the czar ruled Russia." Born in Arkansas in 1876, he died in Reno in 1959 after a quintessential rags-to-riches career. From a ranch boyhood in southeastern Oregon through an early career as a saloon keeper and a professional gambler, Wingfield emerged as a daring capitalist with the 1906 formation of Goldfield Consolidated Mines Company, in partnership with U.S. Senator George S. Nixon. This mine made both men multi-millionaires. George Wingfield's financial acumen was great and his fortune legendary. National newspapers celebrated him as "Nevada's Napoleon." A friend to prominent men, including Bernard Baruch and Herbert Hoover, Wingfield became a significant power in the state of Nevada because he remained in the state with all of his money, instead of leaving us as other mining barons had. His power became controversial, however, as his political activities gradually remade the state in his own image. Fiscally conservative, but socially liberal, George Wingfield supported horse racing, liberalized divorce, and open gambling in Nevada. Many others did not, but his investments gave him tremendous influence in a sparsely populated state. His lifelong opposition to labor unions, for instance, was surely implicated in the suppression of the miners' union in Goldfield in 1908. By the 1930s, when his banks had difficulty, Wingfield was so bitterly resented that all attempts to reorganize and reopen his banks failed. In 1935, defeated and shorn of all political power, Wingfield declared personal bankruptcy. Although a second fabulous gold mine, the Getchell, brought him another fortune in the 1940s and 50s, he never recovered the political authority he had enjoyed at the height of his power in the 1920s. When he died in 1959, however, he had the satisfaction of seeing around him a flourishing economy based on the gambling-and-divorce related tourism he had worked so hard to promote. During his later years, one of Wingfield's favorite places was the property northeast of Reno that he called Spanish Springs Ranch. He bought the land in August 1935, from the estate of the colorful Reno mayor E.E. Roberts, who had used it as a duck preserve. Wingfield owned it until his death in 1959, when he left it to his wife, Roxy Thoma Wingfield. For almost a quarter-century he devoted his efforts to improving it, extending the ponds to attract waterfowl, building hunting blinds, and inviting numerous friends to shoot ducks and grouse, which was his recreational passion. At Spanish Springs Ranch he also bred prize-winning quarterhorses and labrador dogs. He gave the latter to friends throughout the country. The ranch was his constant weekend retreat, and he probably would have lived there year round if his wife had permitted it. The modest house at the center of the old grove provided a beautiful view of the mountains at sunset, and a vista across the entire valley that he had done so much to shape.